Check valves are designed to prevent water flowing in one direction while moving somewhat freely in the other direction. These valves are found in many onboard systems, including sanitation systems, in a variety of raw-water plumbing applications from air-conditioning to sink drains, and in many (too many) bilge-pump plumbing runs. Typically, too much reliance is placed on check valves to prevent flooding. The most common is the swing check valve. Made of bronze, it uses a metallic gate or door that freely opens when fluid flows in one direction and slams shut when fluid attempts to flow in the opposite direction (in most cases, these must be installed close to the horizontal plane to work). The guts of a swing check valve. This one’s corroded “axle” (often made from brass) allows the gate to fall into the water stream, preventing it from checking or reducing flow. A variation on this theme utilizes a plastic body and a rubber gate. Essentially it works the same way: water flow and pressure actuate the gate/flap to move it into the open or closed position, keeping it there as long as pressure is present. In yet another style of check valve, water pressure compresses a spring-loaded disc in the fluid stream, pushing the disc back into the valve body and opening a path for the water to flow around it. If water attempts to flow in the other direction, the disc is forced up against a mating surface, creating a seal. It’s important at this point to draw a clear distinction between check valves and antisiphon valves (also see my article “Antisiphon Valves”). Whereas check valves are designed to prevent water flow in one direction, antisiphon valves break or upset naturally occurring siphon action. The confusion between the two is understandable since they are often used interchangeably to affect the same end—preventing fluid, typically seawater in the case of an antisiphon valve, from flowing in an unwanted direction. The manner in which they operate, however, could not be more different. A large-diameter hose, a deep bilge, a submersible pump, and an in-line check valve (visible in the center of the image, retained by hose clamps) can be a recipe for failure. It’s easy to see why check valves are so commonly used (and misused) for raw-water systems. In their favor, they are convenient and present a neat solution. There are, however, three problems. One, check valves are prone to jamming in the open position, thereby becoming an uncheck valve of sorts. Two, they are prone to jamming in the closed position, preventing water flow in any direction. And three, they can restrict water flow. In experiments I’ve conducted I’ve measured as much as a 50% reduction of water flow when a check valve is installed and working properly, i.e., it’s fully open. 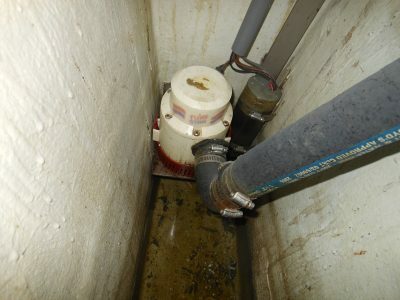 This can be particularly problematic for bilge pump applications. The insidiousness of all three of these problems, particularly for bilge pumps, is that they are not immediately evident. If the check valve is stuck open, the pump runs and pumps just fine; however, it won’t prevent backflow or flooding. On the other hand, if the valve is stuck closed, the pump will run, while creating turbulence around its base, however, it will not pump water, which is why a true bilge pump test involves actual pumping. It’s important to note that check valves can be held closed by the weight of the water in the column above them, which in some cases is too great for a pump to overcome. Again, when tested water around a submersible pump will froth, giving the appearance of pumping action. A traditional bronze check valve uses no metal parts. It’s less prone to sticking and corrosion; however, there is no way to know if the flap is intact without disassembly, and the water column above it will hold it shut under certain circumstances. Finally, it’s difficult to measure the restriction and diminished flow rate unless the flow rate is first measured without the check valve in line. 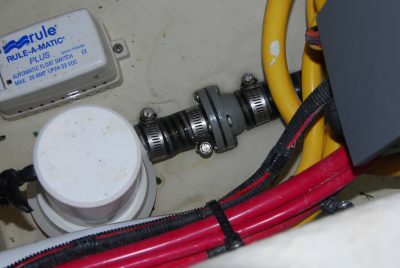 Despite these weaknesses, I frequently encounter check valves in bilge-pump plumbing systems in the course of boat inspections and new-build consultations. In most cases, the goal of the installer is to prevent water from flowing back into the bilge from an especially long discharge hose run. Installing a check valve in line, adjacent to the pump would seem like a natural solution to this problem, but it may lead to disaster. To be clear, American Boat & Yacht Council guidelines clearly prohibit using a check valve to prevent flooding, i.e., water running into the vessel’s hull from a submerged discharge opening. Therefore, if the bilge pump discharge is below the waterline when the boat is at rest or in any state of trim or operation (including to some extent a grounding), a check valve must not be all that stands between the bilges and the body of water in which the vessel is floating. Somewhat less objectionable, this check valve is located at the point of discharge, where at least the water column issue is eliminated. A riser and antisiphon valve would accomplish the same task with less risk. 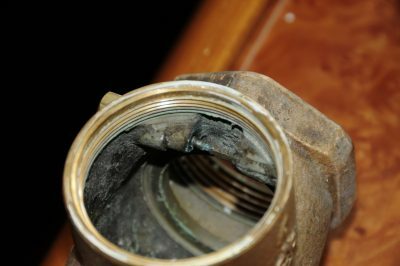 Additionally, don’t use check valves to prevent back-flooding in systems with an overboard manifold. In these systems, which are not uncommon, multiple pumps and other discharges drain into either a standpipe or a horizontal pipe running the length of the vessel. 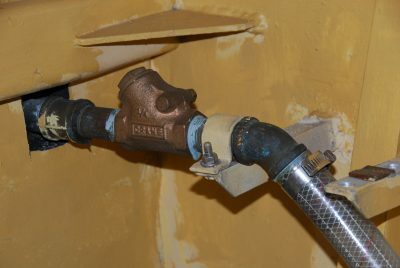 Water must not be able to flow back out of any of these plumbing connections when any or all pumps are running, and a check valve cannot be used to accomplish this goal. When I managed a boatyard I instructed my technicians to use check valves in raw-water systems only as a last resort. In many cases, an antisiphon valve will achieve the same end with far less risk of failure.